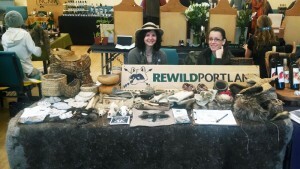 Rewild Portland is a mostly volunteer-run organization. We are always looking to find more people who want to chip in and make our mission come to life. We’ve grown a lot in the last year and are seeking new and more volunteers! We have a variety of volunteer tasks, and encourage people to help where they feel most inspired. If you are interested, please attend a volunteer orientation. The volunteer orientation is a time to familiarize yourself with our organization and mission, learn about volunteer opportunities for the coming year, and meet other volunteers and the Rewild Portland staff. It’s also a great way to become more involved in the Rewild Portland community. We show our appreciation for regular volunteers by offering free classes specifically for them, as well as inviting them to come along on our member hikes. Our Free Skills Series began with just a few friends hanging out in the park. Now it involves 30–60 people (and even more projected for this coming year) coming to learn more about the month’s topic. The growth of this series is fantastic! It shows that more people are interested in rewilding, more people are hearing about the community of rewilding in Portland, and there are more opportunities for “social capital.” However, with this growth comes the challenge of relating the information in a way that retains quality. 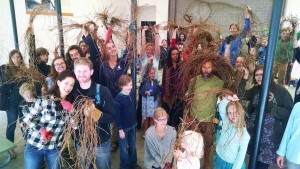 Last year Peter taught the ivy basketry Free Skills Series class by himself, with more than 50 people in attendance. That was crazy! Although it worked out, that is not our goal. We are seeking crafters, makers, teachers, and anyone who would love to help us out with our Free Skills Series. We need people who can act as greeters for new folks, assistants to teachers, teachers, and volunteers who can simply facilitate the program with us. We consider outreach to mean educating the public about who we are and what we do. We have four main outreach goals: documentation, tabling, flyering, and social media. Documentation means taking pictures and video of our programs. We can then use these materials to create flyers, social media campaigns, and more. Tabling helps us get the word out about our programs and is also an opportunity for education. Our table is full of examples of the kinds of items that we teach people how to make, acting as a sort of portable “museum” of ancestral technology. While tabling we engage the public, telling people the histories and stories of each item on the table. Flyering is more of just the marketing aspect of our organization. We want to let people know about our programs. To do this, we put up posters and handbills in strategic locations around the Portland area. With more volunteers, this takes much less time! Social media helps us utilize the internet to connect people to Rewild Portland. There is an irony to using digital technology to get people to use it less, but this is the state of things for most urban people. Social media assistance can be as simple as sharing our Free Skills Series on your Facebook wall. It can also mean helping us strategize a campaign. We are always seeking professional grant writers to help us research and write grants. Each year we run three major fundraising campaigns: a silent auction, a membership drive, and an online fundraiser. We need help putting each of these together. There are many moving parts and each campaign is different and requires a different kind of help. This event requires many phone calls and e-mails soliciting donations for the auction. We also seek out musicians to play and a speaker to give a talk on a subject related to rewilding. Helping out at the event is key! We are still in the process of reconfiguring how to make this work. Once a year we produce a video and do a Kickstarter-like fundraiser. While our auction and member drive are driven to bring in local folks, there are many people who want to help us from afar. This online campaign helps us reach a larger audience of support. We need help producing the video and researching places to promote it online. The IT world is very expensive, so any help in this area is greatly appreciated. If you are interested in volunteering, please send us a note. Thank you!